Chris Branson says that being the youngest of five children stimulated the maturity that his business requires. He recognized this at the young age of 18-years-old when he decided what he wanted as his future career. 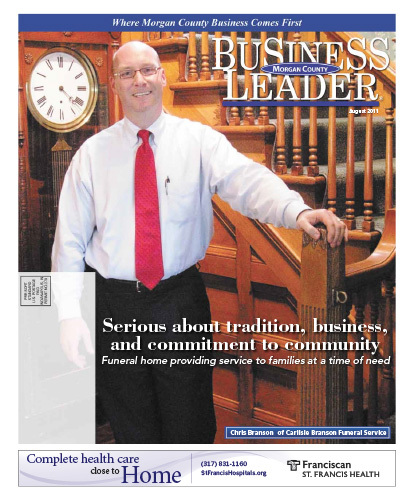 He achieved that career as funeral director and owner of the Carlisle Branson Funeral Service and Crematory. He was attracted to the industry by the ceremony involved and the way it helped people. The maturity he developed as a young man still pervades his days: he’s serious about his business and the work he does, his role as a father and his role in the community. Branson said, “There are lots of things you can be in life, but because of the uniqueness of our industry, it becomes who you are.” It makes for a very fine line between business and life for the Branson family, which is evidenced by the way his conversation intermingles business, family and community. Download the full August 2011 Edition here.